ARE, Sweden (AP) - Of all the people flying in to attend Lindsey Vonn's final race - her dad and two siblings, U.S. Ski Team top brass and even Swedish great Ingemar Stenmark - one very significant other will be missing. P.K. Subban, Vonn's boyfriend and a defenseman for the NHL's Nashville Predators, has a game to play in Tennessee on Sunday hours after Vonn bids skiing goodbye in the downhill at the world championships in Sweden. "I would've liked to be there for that and celebrate with her," Subban told The Associated Press. "I've got to do the best I can to support her from afar." Earlier this season, when Vonn was out recovering from another in a long line of knee injuries, Subban kept Vonn's spirits up when she couldn't even bear to watch a ski race. "It's a great thing that I have such an upbeat boyfriend," Vonn said. "He runs around in a pajama suit making me laugh and that takes my mind off of things. He's just always positive and happy and maybe a little too energetic at times. But it definitely helped me mentally to be in Nashville and be around him and not focus so much on skiing but just getting healthy and working as hard as I can." 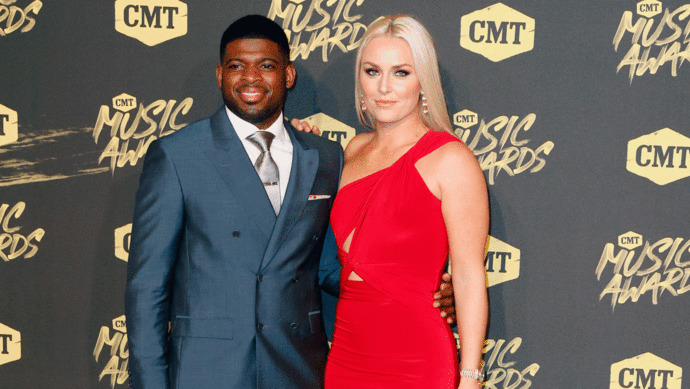 She and Subban went public with their relationship in June when they walked the red carpet together at the CMT Music Awards in Nashville. Then on July 4th, Subban tweeted a photo of him and Vonnwearing the same U.S.-flag themed women's bathing suit, asking "who wore it better?" One of the biggest personalities in hockey, Subban - or "the Subbanator" as he is nicknamed - hosted a TV special after the NHL's All-Star Skills competition last month, featuring him telling jokes in an opening monologue, talking with some guests and some taped segments. He also started a digital series called "The P.K. Project" to give viewers a look at his personal life. On the first episode, he had Vonn on a video call while visiting his family - revealing that he's not the only one in the relationship who goes by initials, with his mom referring to "that lovely L.V." Subban "has no idea about ski racing," said Vonn, the women's record holder with 82 World Cup wins, trailing only the overall record of 86 held by Stenmark. "I've kind of tried to watch some video with him and he has absolutely no clue. He's like, 'I'll be honest, I don't care about skiing, I just care about you.' And that's kind of cute but it's kind of annoying at the same time. But I don't know much about hockey. All I know is forecheck. I don't even know what that means, really." While it may seem strange that Vonn, who grew up in the hockey hotbed of Minnesota, knows so little about her boyfriend's sport, she says it's a result of the Minnesota North Stars' move to Dallas in 1993. "I grew up pretty much my whole childhood not having a hockey team," Vonn said. "So just because I'm from Minnesota doesn't mean I should know hockey." So which team does Vonn, who was living in Colorado when she started dating Subban, support? The Colorado Avalanche or Subban's Predators? "It's Colorado. Well, I mean that's the hard part," she said. "When I moved to Colorado I watched the Avalanche win the Stanley Cup and I've been to a lot of Avalanche games but I can't really say anything other than Nashville." Can Subban ski? "I think he can snowboard but that's it," Vonn said, adding that she has no plans to take him out on the slopes and endanger his career. "Oh no. He's got a job to do. I'm not taking any risks on that one." Does Vonn skate? "Oh yeah. I'm from Minnesota." Vonn talks to Subban on a video call during a news conference. Vonn won the downhill at the 2010 Vancouver Games and Subban, who is from Toronto, was on Canada's team that won the hockey tournament at the 2014 Sochi Games. "I wear my jacket in the stadium," Vonn said. "He could have played tennis, or an indoor sport that was actually warm, that would have been helpful." The day after Vonn retires, she will fly to Nashville to see Subban - and begin her new life as a professional hockey fan. "I'll be there like every time now. It will be fun," she said. "They got two new players the other day, everything looks great for them: Try to get the division title and go for the Stanley Cup. So I'll be there cheering them on." Walker reported from Nashville, Tenn.